Chere Amie: The nursery - Completed! - Part ONE~! BCW's (Baby Cheramie Walz) arrival is imminent, and we've recently completed the nursery. (Well, almost. We still need to get one more wicked cute throw rug to add some warmth to the floor.) We were going for gender-neutral, colorful, playful and cheery ... and I think we achieve that. Here are some work in progress pics. The room was originally our "office" though we spent little time in there and usually kept the door closed. Mark's first undertaking was the radiator cover, then he completed the wainscotting from scratch (each piece individually cut so that everything was level). Painting was a group effort, though I tired out quite quickly. We chose a Robin's Egg Blue from Velspar (and I wore a mask while painting). The dresser was Mark's from childhood (and previously his grandmother's) which we (who am I kdding!) stripped, sanded, painted and pimped out. Stay tuned for finished pics and all the little shopping details! Hi there! It looks great and so exciting it will be full of life so soon! 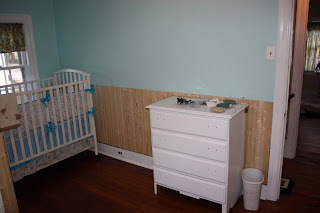 I came across your nursery on Spearmint Baby's blog. It was kind of wild because every picture had me saying "hey, we have that in our nursery". Diaper bag, books, humidifier, skip hop comb set, wall color, birds. So needless to say. Looks great, love it!